What is our Accelerated Solutions Environment and why do more than a third of FTSE 100 and Fortune 500 companies use it to solve complex business issues? Solving problems is a part of doing business. But bringing together key stakeholders from multiple business areas and geographies to find solutions can compound the problem and take months, or even years. Moreover, organizational and cultural conflicts can make it difficult for employees to commit to and manage change quickly. Organizations have to engage with a growing and changing list of client groups and third parties. They need an innovative way to unite their stakeholders to collaborate on sustainable solutions that meet with consensus within hours and days. The ASE brings together the right people, with the right content, underpinned by a rigorous method and process. This collaborative way of working offers a different look and feel to a traditional change program. As you start to infuse greater collaboration into the day-to-day, you will find improvements in your work culture and ways of working between functional areas. Working with the ASE facilitation team and large-scale change model, we will propel your organization from solution design to implementation. We organize events of one to three or more days called ASE DesignSessions. In many cases, our dedicated teams will scope, design and facilitate multiple ASE DesignSessions over a project lifecycle to help you and your key stakeholders to align and implement change successfully. We also offer an „Acceleration Zone”, a custom built collaborative workspace that is established on-site at your location. 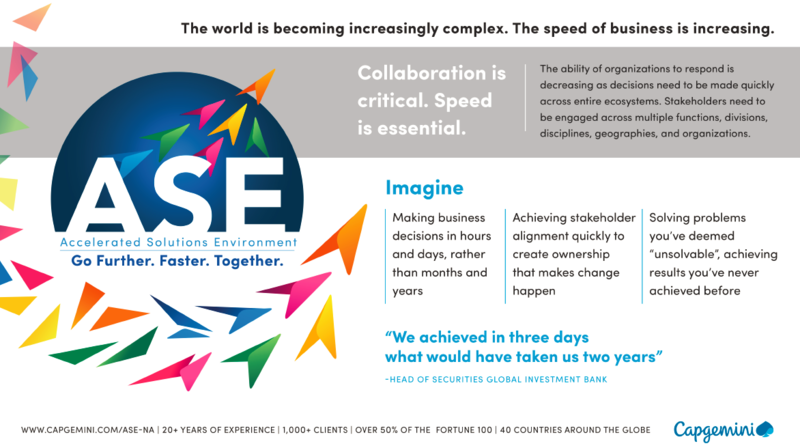 Contact your local center to learn how the ASE can help you accelerate your business solutions.